Andrea (name changed) is in her 40’s and runs a busy household. For a few months, she had been waking up with a headache. Not daily at first, though recently they had become more frequent. The headache would resolve after being up a while, but recently it has lingered through the day. She scheduled a visit with her family doctor. There, she described a frontal, throbbing, and, at times, sharp headache. The past couple of weeks, she reported, episodes of numbness and weakness in the right hand and dizziness when changing positions. A neurological examination revealed moderate difficulty walking with one foot in front of the other. Otherwise, the exam was normal. Her provider ordered an MRI of the brain which revealed the ventricles (spinal fluid spaces inside the brain) to be somewhat larger than normal – a condition called hydrocephalus (Figure 1). Something was blocking the flow of spinal fluid through the ventricles, but what could it be? Figure 1 – Cross-section MRI showing enlargement of the ventricles (dark fluid filled spaces) in the center of the brain. In the side view (sagittal) MRI, a tumor could be seen inside of the fourth ventricle, the fluid space between the brainstem and the cerebellum (Figure 2). 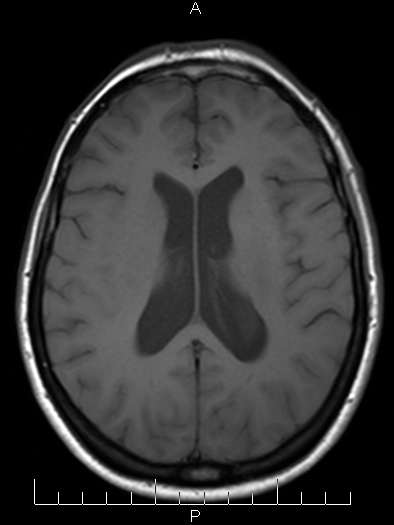 A cross section MRI scan (Figure 3), performed after she had received received intravenous contrast (“dye” material given through a vein), clearly outlined the tumor (Figure 3). It was blocking blocking cerebrospinal fluid (CSF) flow and enlarging the ventricle. This explained why the ventricles in the upper brain looked too big. 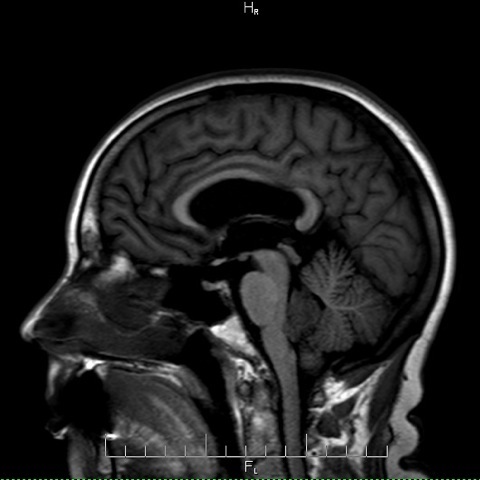 Figure 2 – Side view MRI of the brain showing the tumor between the brainstem and the cerebellum. Figure 3 – Cross section view of the lower brain area. The tumor is easily after intravenous contrast was given. There are various treatments for brain tumors. Some tumors are first diagnosed with a needle biopsy, while others may be treated with specialized radiation called radiosurgery. However, in many cases, surgery is required to remove the tumor. In Andrea’s case, the tumor was blocking CSF flow. If the blockage became worse, which was very likely since the tumor would keep growing, it could render her unconscious and jeopardize her life. A needle biopsy would not resolve the CSF blockage. After careful discussions with her and her husband, she was readied for surgery. The plan was to reach the tumor through a cranial opening (craniotomy) at the back of the head. Once the membrane surrounding the brain was exposed and opened, a path would be developed between the two halves of the lower cerebellum (called the cerebellar tonsils). With gentle separation of the cerebellar tonsils, the lower part of the tumor came into view (Figure 4). 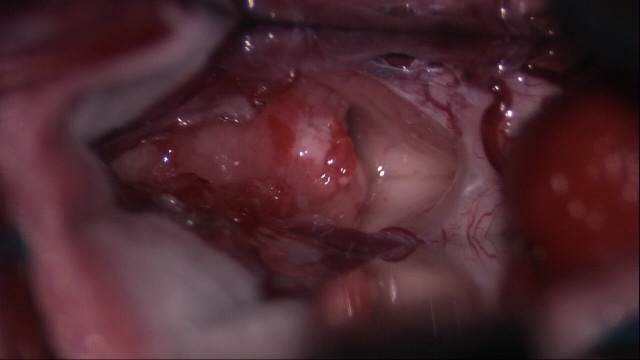 Figure 4 – Microphotograph during surgery showing the lower portion of the tumor between the cerebellar tonsils. After a biopsy was obtained, the tumor was removed through microsurgery using the neurosurgical microscope, microsurgical instruments, and an ultrasonic aspirator – an instrument whose tip vibrates at ultrasonic frequencies and morselize (break-down) the cells. (This tool has replaced the laser that came into use in the 1980’s, although there are still a few applications for it today). Using the gentle action of the ultrasonic aspirator and microsurgical dissection, the tumor was steadily removed. 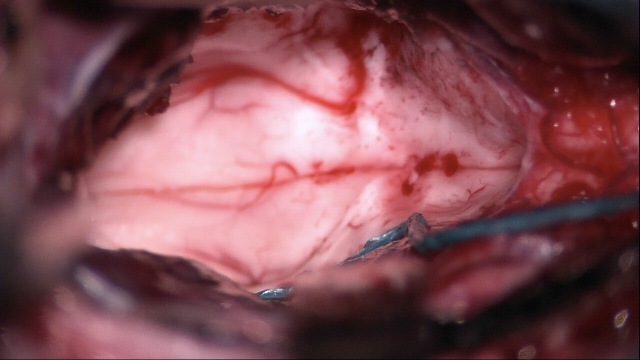 Inspection of the floor of the fourth ventricle showed no residual tumor (Figure 5). Figure 5 – View of the bottom of the fourth ventricle after the tumor was removed. Andrea stayed in the hospital for … days and was then discharged home with her family. She steadily resumed her normal activities. 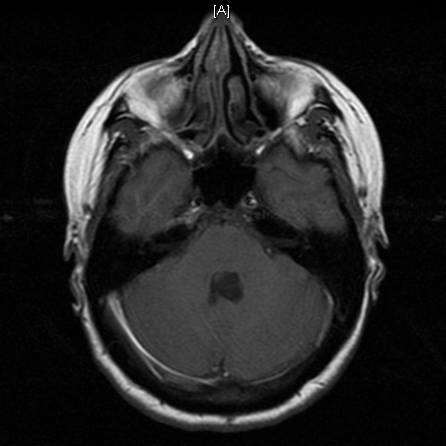 Follow-up brain MRI scans have shown no residual tumor (Figure 6). Happily, she has recovered completely and is back to her busy life. 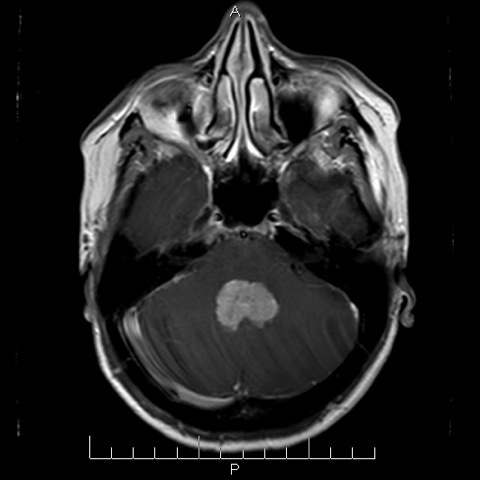 Figure 6 – MRI scan performed 7 months after surgery shows no evidence of tumor. Other tumors found within the ventricles are a choroid plexus papillomas and meningiomas. A metastasis from a tumor elsewhere in the body can also develop within the ventricles. The pathological examination of Andrea’s tumor revealed it to be a choroid plexus papilloma. Follow-up MRI scans within the first year following surgery have shown no tumor. The chances of the tumor coming back from unseen cells buried within the tissues are about 10%. MRI scans will be performed on a regular basis for a few years. Morrison G, Sobel DF, Kelley WM, Norman D.
Sleep is fundamental to good health. Sleep impacts the quality of your day, and what happens during the day impacts the quality of your sleep. While many factors affect sleep, one we can control, yet often don’t, is the intensity of light we are exposed to before bedtime. As we saw in The End of Night, the development of the light bulb and alternating current allowed us to effectively eliminate night at will. Since most of us prefer to get a good night’s sleep, recall during the Paleolithic the slow decrease in light intensity at dusk prepared the brain for sleep, primarily by the secretion of melatonin. Today, we often keep the room lights on until bedtime and then, once turned off, expect to fall asleep effortlessly. For millions of Americans, the failure to adequately prepare the brain results in nonrestorative sleep. Our study shows that this exposure to indoor light has a strong suppressive effect on the hormone melatonin. This could, in turn, have effects on sleep quality and the body’s ability to regulate body temperature, blood pressure and glucose levels. While it is not practical to dim the lights for 8 hours prior to sleep, at least an hour of dim light should help those with difficulty initiating sleep. A good solution is to install dimmer switches in the rooms most frequented at dusk and a dimmer switch on the nightstand lamp. As we create our own modern Paleolithic, maybe homes in the future will be programmable to dim electric lighting automatically at a set time and rate. The first signs of human consciousness were found in Blombos Cave, South Africa and date to 70 to 80 thousand years ago. It is probably no accident that the site is littered with evidence of seafood consumption. Indeed, significant inclusion of seafood and fish in the human diet may represent the final nutritional factor in development of the human mind. The typical American diet is profoundly different from that of our Paleolithic ancestors and is increasingly considered the root of many modern diseases. This observational study is just one additional piece of evidence demonstrating our continued movement away from the original human diet comes at a price. In this case, a shrinking brain.